DELICIOUS AND EASY TURKEY POT PIE RECIPE. 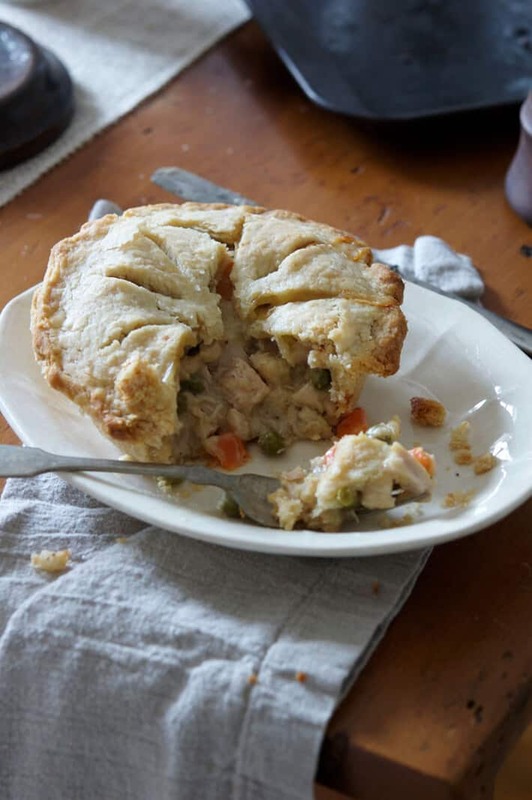 This is – for real – a delicious turkey pot pie recipe. I know because I have very acute memories from my childhood to compare it to. Ah, the sound of the little cardboard box opening, the frost covered mini aluminum pan landing on the counter with a thud. Always, ALWAYS served with a bottle of ketchup and canned peas. Some nights if we were very lucky and the pot pies had been sitting in the freezer for long enough we could actually taste the metallic aluminum with every bite. These kind of meals were not uncommon in my neighbourhood at the time. Every kid who ran outside after dinner to play a quick game of hide and seek either had fish sticks, frozen pot pies or canned mushroom soup on their breath. Mothers worked, frozen stuff was always on sale and kids would eat it because it was a non threatening shade of beige and all pretty much tasted the same; like salt. Years later, when I had moved out on my own, I picked up a frozen chicken pot pie and was kind of shocked at how it was nothing like I remembered it. It wasn’t delicious. It wasn’t even good. That’s when I started to develop my own Chicken Pot Pie recipe. Most of them also weren’t delicious or good. But a few years ago it all finally clicked. I found a recipe online that acted as a good base and over the years I’ve changed it over and over again until it’s now ready for unveiling. 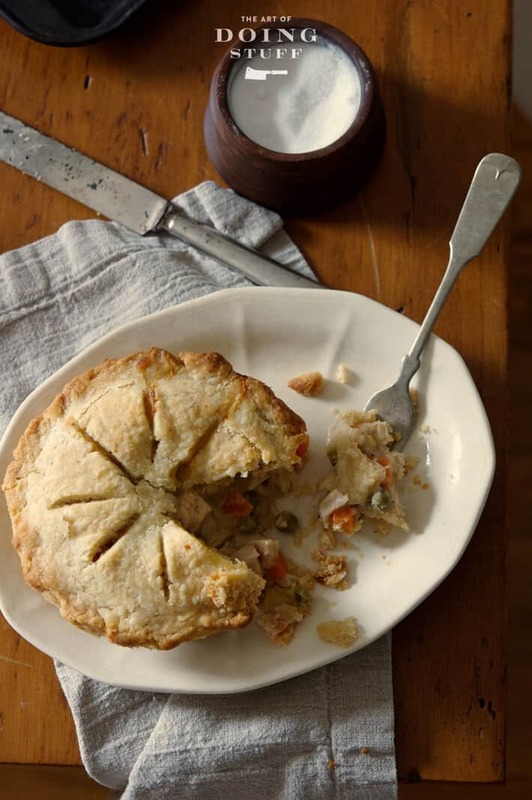 The best part is you can use Thanksgiving leftovers to make this turkey pot pie recipe, which is exactly what these are made out of. After Thanksgiving I stripped the remaining meat off of my turkey and the turkey I pilfered from my friend Amos. (Every year I pilfer at least one Thanksgiving turkey carcass from a friend or neighbour.) Those two turkeys gave me over 20 jars of delicious turkey broth (here’s my recipe) and several Turkey Pot Pies. You can make your own pie dough or just use a frozen crust. You can make it BIG or you can make small individual ones. I used disposable aluminum pie tins from the Dollar store but I just saw that Amazon has reusable 5″ pie pans that would be perfect for meat pies. TIP: For a perfectly balanced crust use 60% butter and 40% lard. 100% lard and your crust will be so flaky it’ll fall apart. 100% butter and it’ll be too dense. 60/40 is the perfect ratio. I often use this recipe from Ashley English of Small Measure but I use the 60/40 butter and lard ratio instead of 100% butter. It’s from her cookbook A Year of Pies. You can make it with more sauce or drier with less sauce. It, like all recipes, should be adapted to your own tastes. It’s filled with chunks of chicken, peas, carrots and seasoning. Nothing weird. Nothing you won’t have on hand. Well … except the celery seed. You might not have that and it is CRUCIAL. The celery seed is what gives it that indescribable but delicious flavour. It took a while to figure out the ratio of liquids I liked. I like the pot pie to be creamy and gravy filled but I don’t want it to be so filled with gravy that it oozes all over the plate when you cut into it. If you’re an oozer I’ll tell you how to amend the recipe for some ooziness. 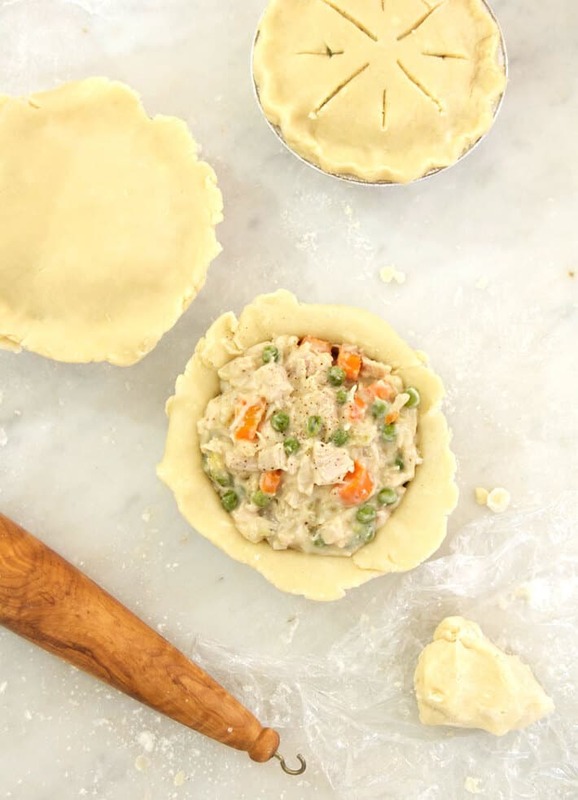 The really great part about this delicious turkey pot pie recipe is the fact that you can make it in advance and then pop them in the freezer. Just like mom used to make. This turkey pot pie can be made in advance and frozen, ready to pop into the oven on a blustery winter night. Freeze after assembly, then cook from frozen for approximately 1 hour 30 minutes. *If you like a pot pie with a lot of gravy oozing out of it then double these ingredients. Combine carrots, peas and celery in a pot with the chicken broth. Bring it to the boil then simmer it with the lid on until veg are tender. 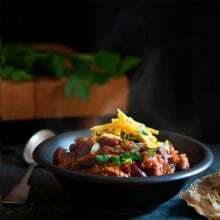 Remove vegetables from the pot with a slotted spoon and transfer them to a bowl. Cook onions in butter in a saucepan until translucent. Whisk in flour, salt, pepper and celery seed. Slowly whisk in reserved chicken broth and the milk. Simmer until thick and gravy like. (NOTE: if you have gravy leftover from Thanksgiving dinner you can simply use that as your gravy base and omit the broth and milk. You'll need 2 1/2 cups of gravy. Add the vegetables and chicken to your saucepan of gravy and mix. Pour mixture into pie shells, cover with top crusts and seal. Cut slits into top of crust so steam can get out. Bake for 30-35 minutes or until crust is golden. Made with leftover mashed potatoes. 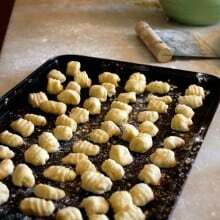 Homemade pasta recipe | With just 3 ingredients you already have. When I host Christmas dinner this is what we have ..no fuss or muss , just add salad and cranberry sauce and maybe a pickle tray. Everyone loves it and it’s so easy !! I’ve got two in my freezer waiting to paired with some french fries and may be even canned peas. 😉 ~ karen! Canned peas with the correct meal rock. I only have them perhaps twice a year but nothing else works with meatloaf, mash and gravy. Hi Terri! I’ll amend the recipe. It makes enough for 4 very large individual pot pies. (as in you only need to eat half of one) ~ karen! So delicious looking, interesting about the lard to butter ratio. Is that for all pastry? I’m still trying to recover from not realizing until November 11, that the Christmas pledge was actually the calendar for November, and that I was already 11 days late…I am recovering, just not as quickly as I would like. I fully intend on completing this month in whatever time I have left, just so you know. I would rather scramble now, than add it all to my list of things to do in December. I am probably spending more time than necessary on Pinterest, but research counts. Right? I just wish I could see your wrapping for this year…You know, before Christmas is over…:) I can’t help it if I’m not as inventive as you, but that’s why I’m here, lol. Most people revert to the present wrapping I did the year before so they have more time. 🙂 Last year it was black with gold ornate picture frames with photos of the recipient when they were young in it. Also a huge gold flower. https://www.theartofdoingstuff.com/christmas-gift-wrapping-2016-back-black/ ~ karen! Yes, I loved that, but black and gold wouldn’t go with my theme. However, the young picture is a great idea and would be good with other colours too I think. Thanks! I did some of your dioramas a couple years ago with great success, but I am sooooo curious!!! Yes, just use whatever colour you want. Party City has tons of plain wrapping paper in every shade imaginable and it’s cheap. ~ karen! Morning, just read this and now my tummy is rumbling for chicken pot pie. Unfortunately, it’s going to get homemade muesli, coconut yoghurt and green tea. It’s not happy! Do you have a problem with using vodka in your pie crust recipes? 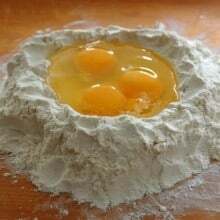 I find it makes a good crust BETTER! I agree.. The Vodka is cut in half with ice water. It doesn’t react with the gluten in the flour the same way water does, so it makes the dough easier to manipulate. Less handling makes a better pie crust. (Un) fortunately the vodka results inno change to the flavour. Wow, I’ve never thought to do this. I’m going to give it a try! I keep my vodka in the freezer anyway so added to the water for the crust, it keeps the butter/lard from overheating. It makes a MUCH flakier crust (and the alcohol cooks off so there’s no alcohol or flavor change). I love homemade pies! We live in a small town with one corner store and it carries local things like asparagus from a someone’s garden in the spring, etc. They also carry some homemade chicken pies with big pieces of white meat chicken, not cheap but so worth it. I will give this recipe a try, thanks. I have a chicken in the fridge as I type. Ready for roasting tomorrow and chicken pie on Friday night. In our house you have to have canned peas with hot chicken or roast beef sandwiches, nothing else works. Most presents bought,one tree goes up tomorrow and Thursday night is the big gingerbread house building party. I know this will be sacrilege to you frozen pea and carrot lovers, but I substitute lightly sauteed, sliced mushrooms for the frozen veggies to make an elegant pot pie. Another favorite is using cooked green chiles (like Hatch) instead of peas and carrots. Adds a mild southwestern flair and is still yummy. I just found a clear plastic folder that I created last year with The Thanksgiving menu and the recipes for every single dish I make! How smart I was last year! 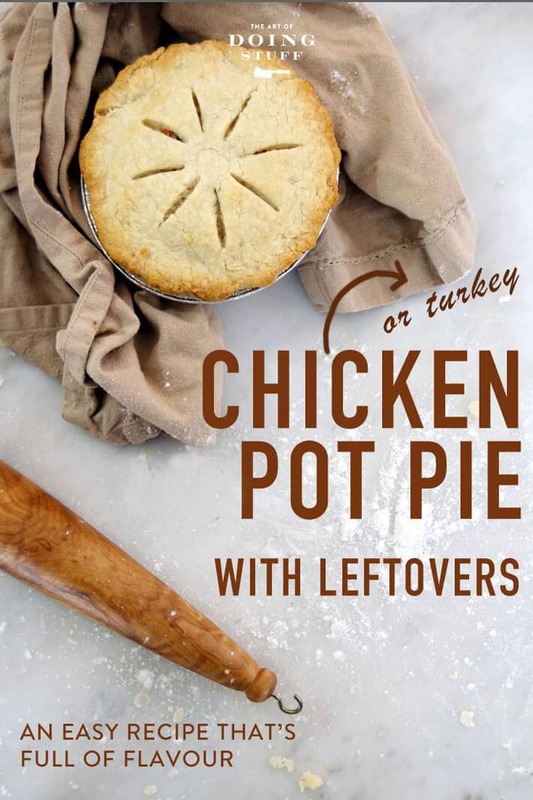 I’m adding some leftover turkey recipes (your pot pie) and maybe the grocery list! Now if —next year, IF I can remember I’ve done it … I’ll be so HAPPY! Nice job! (on the plastic folder, not the forgetting) 😉 ~ karen! yummy! Hmmm. Would this work with pork roast? Parents have never liked turkey but made it anyway. This year we convinced them that we are fine with having something else that they actually like. Thus: pork roast with all the turkey trimmings. Because T’giving without stuffing and cranberry would just be…wrong. Sounds yummy. I will add potatoes and corn to mine, and try the lard trick for all my crusts. I much prefer a bottom crust on pot pies, which is why when I DO buy one, it is a Marie Callender. My adult children have been trying to get me to make pot pie, but mine goes in a 4 qt cake pan, and I really really do not like making crust! Maybe the lard version will be easier. Anyway, hope your Thanksgiving went well, and hope mine does too! Not frozen crusts! Buy the refrigerated pie crust and just unroll them. Much better than frozen. IMHO. Refrigerated crust? Didn’t know there was such a thing. Wonder if we have them here in Ontario? Are they a brand name product or ? Pillsbury makes one. My local grocery also makes their own but I don’t think it’s as good. If it not bit enough you could try rolling it out a little thinner. And for the really big potpie I am doomed to either piece or make my own…sob…. haha! Thanks Donna. 🙂 But let’s just ignore the one of the uncooked pie that I had to take at night, with my iPhone. ~ karen! Hi Joules! That’s intentional. 🙂 So when people are searching on Google in years to come for either a chicken pot pie or a turkey pot pie my post will pop up. ~ karen! Thank you for the lard tip. I used to make the best pies with wonderful crust. Now I just scrape the good pie insides and leave the crust. Never realized over the years how recipes had changed. It is even hard to find lard at the store. 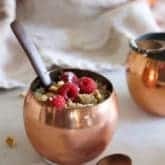 I needed a recipe so you have made my day! Maybe now it will be like the ‘good old days’ at least in pie. I think I used to used to use Crisco, which I can find. Lard is great! But a 100% lard crust will just be a crumbly mess most of the time. ~ karen! Do you think this would maybe manage to fill a couple of regular pie tins? I’m making these to transport to our cabin in the sierras, and little pies seem like they’d be more fussy. I’m making our turkey on the BBQ up there. Tried it last weekend, and it worked out well. The upside of the project is that I get to make the “leftover” meal for later in the weekend before we get there. Bonus! I was thinking about enchiladas (so California), but I think I’ve changed my mind as this looks so cozy. They’re delicious Kristina. I promise. I think the filling would make 2 *scant* regular sized pies. So the lid crust wouldn’t be puffed up and overflowing like in these pies. If you’re worried just add another half to all the ingredients. (instead of 1 lb of turkey add 1.5 lbs, instead of 1 cup of carrots add 1.5 cups and so on) ~ karen! My favorite part is setting the oven to 426 degrees! Looks & sounds great, Karen. I make one large chicken pot pie in a frozen pie crust (9″-deep dish), sometimes using up leftovers from a rotisserie chicken. I make the gravy part from a dry gravy mix & make extra gravy to add to your plate when you get your piece of the pie. I add a frozen pie crust on the top & brush it with water & sprinkle celery seed on top. I have made these using leftover beef roast, too. We love them. My husband & I can’t eat a whole pie & usually give the other 1/2 to our neighbors for their dinner. We share soups & chili with them also. Ok, we’re moving in next door. Ummm, where do you live? Thanks for the reminder. I used to make the broth from the carcass, after stripping off all the meat and would make the turkey pies. I have also made Tea biscuit dough, rolled it out and used the turkey filling to make Turkey Pinwheels. They are great with gravy and cranberry. And of course, canned peas. All of these were in the Five Roses Cookbook I bought in 1968 as a bride in my new kitchen. I have lost 2 over the years as I moved. (Offerings to the Moving Gods, no doubt). My 3rd one is nice, but they are getting harder to find. please, can I come to your house? Karen, thanks for the awesome recipe!! I absolutely love your squash soup and garnish and added roasted pumpkin as I had it on hand and it was incredible! Every week we have your soup! The garnish is wonderful too. We’ll have to add this pot pie to the mix. Thanks for the recipe and I look forward to your next post!! That sounds so delicious! My husband is a vegetarian and I’m always at a loss on what to do with all of the turkey leftovers we’re sent home with. 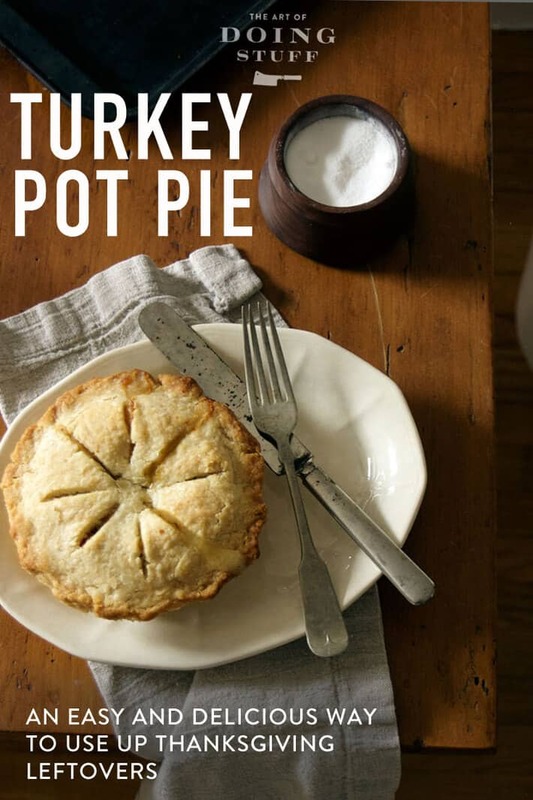 I’m absolutely going to be making some of these pies and freezing them for a later day. I really enjoyed your blog but it has become overcrowded with ads. So many that I have to delete them so that I can get through your blog. I know this is the way that you earn your income but it use to not be this way. Good Luck! hey Karen, I found a NYtimes article with Turkey Pho – made my own version with chicken carcass (well, I am Canadian so no turkey right now). OMFG it is SOOOOO good. AND I forgot the salt, didn’t have fish sauce, and half the time forget the lime juice. Take-aways? Make your broth with a thumb of ginger and 3 star anise thingies. and about 1/4 cup of brown sugar. (and, if you remember, some salt would be a good idea). cool and strain and drain and then, when you are ready to eat, heat the broth, throw in your chopped turkey or chicken. Meanwhile boil water and cook rice vermacelli noodles (3-4 minutes). Chop up some cilantro and green onions and (if you remember to buy them) bean sprouts. put broth and chicken/ turkey into a bowl., add the noodles, garnish with green stuff. drizzle with lime sauce and soya and sesame and maybe siracha or anything, actually. Slurp up with fork/chopstix/spoon. YUM. Next time I am SO pressure canning this. this time? I am SOOOO taking it for lunch, over and over…. Good to know! I probably (definitely) wouldn’t do my whole batch of broth like that because .. well … I need my broth. But I’ll be trying the recipe to make my own Pho with my canned broth. 🙂 Thx. ~ karen! yeah, glad that #1 son has moved home, he eats leftovers the way they are designed to be eaten! AND I have a lot of canned (pressure canned) broth so can be all free and easy about making Pho…. because I can. I made this last night to use up some leftover chicken from a previous broth-making, and also because my kids love pot pie. I did cheat with store bought crust because it was a work night, but I otherwise followed your recipe. I didn’t eat the finished pie, because I hate peas and I sacrifice for my family like that, but it smelled like heaven, the bite of the filling I tried after pushing the peas aside was SO delicious, and my kids inhaled it. This is a definite keeper – Thanks! I’m so glad you liked it Karin! Well, sort of liked it, lol. It really is a good recipe. ~ karen!